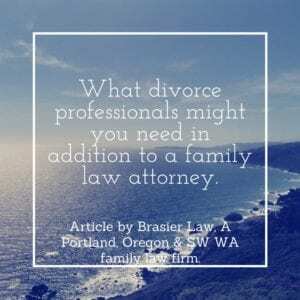 Portland Divorce: What Divorce Professionals Might I Need? Sometimes when going through a divorce or custody case, people might need to work with more professionals than just their attorney. This article briefly touches on some of the commonly used resources divorcing couples use, and gives some recommendations on who might be a good resource to contact if you need such service. The most common professional to use during a divorce, aside from your lawyer, is probably a mediator. Mediator’s can be very helpful in assisting people in working through a resolution when they are both motivated to resolve the conflict, and are both reasonably close in their positions. The mediator I personally use in my family law practice more than any other is Scott Sorenson-Jolink. You can find his contact information here on his website. He is a practicing attorney who focuses most of his practice on mediation of family law cases. He is professional, experienced, and very well suited to helping parties navigate the difficult emotional waters of resolving their divorce or custody case. We also recommend reading our article Do I Need a Family Law Attorney for my Portland Mediation. This article helps describe how having a divorce attorney to help you prepare for a mediation can be helpful to the outcome. Another article that may be helpful is: Oregon Divorce Mediation: A Method for Keeping Your Case Out of Court. Sometimes when parents can’t agree on who should be the primary custodial parent, or on what the parenting plan should be, they will hire a custody evaluator to make a recommendation. This person, usually a doctor of psychology, will perform their own investigation, and issue a report outlining what they feel is in the child’s best interests and why. Evaluations can be expensive, but in some cases are worth every penny. There are a lot of evaluators out there, and many of them do a very poor job honestly. The evaluator who I recommend most highly is Dr. Wendy Bourg. You can find her contact information on her website. Sometimes children are so stressed by the pending divorce, or have been harmed by one parent, that they then need to receive therapy services to help them. I personally don’t like using counselors for children unless absolutely necessary, as I find the field to be a difficult one to really see results, and sometimes can cause more harm than good. This is just a personal belief and some people feel differently and each family needs to decide what is best for them. If you are looking for a starting point for therapy there are many options in Portland. The most experienced program in town is Morrison Child and Family Services, and they are at the very least a starting point in your search for the right counselor for your children if you need one. There are many other situations that require different professionals to help you. These can include hiring someone to formally transfer a portion of a retirement benefit, or to appraise the value of your property. It can also include evaluations of a person, such as having a work history performed to prove your spouse or you are capable/incapable of making a certain income level. Some people even need mental health evaluations or psycho-sexual assessments completed depending on the nature of your situation. Contacting a local attorney can help you determine what professionals you need to hire to get you the best possible result from your divorce or custody case. 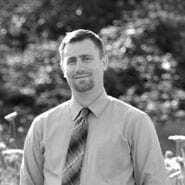 Tom Brasier is a family law attorney practicing in the greater Portland area including Clark County and Clackamas. You can reach Tom for a free consult about your divorce, custody, or restraining order case by calling 1 (503) 855-4777 or by submitting the contact form below.